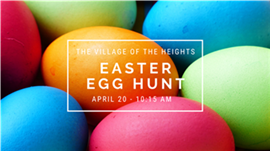 Our Grandfriends at The Village of The Heights have made Easter Eggs for your children! Join us at 10:15 this Saturday, April 20 for a Music Together® class and an Easter Egg hunt! Our music class for children from birth to age 5, will have you movin' & groovin' as you make life-long musical memories. Bring your own Easter Basket and come ready to sing & dance!